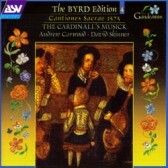 The Cantiones Sacrae of 1575 was Byrd’s first publication and one that he undertook jointly with his friend and business partner, Thomas Tallis. In a break with the usual style there are no Gradualia motets here but rather all of Byrd’s motets that he decided to put forward for publication. The range in styles is huge: from the serenity of the eight-part canon Diliges Dominum to the monumental motet in honour of the Trinity, Tribue Domine. This collection is probably the most varied that Byrd published. There is not the preponderance of mourning and lamentation found in the set from 1589. Byrd and Tallis are obviously using the music to show just how capable English musicians could be.